PCANSW State Championships was Symmetry’s and my first major competition together and I could be happier with how we performed. We started with Show Riding on the Monday and Tuesday with placing in the top 8 in the rider class out of 72 riders. I was so proud of how Sym took in the atmosphere like she had done it for years. Next came Equitation on Wednesday and Thursday, things did not go to plan in our first round having a crash into jump 6b (Sym thinking it was a bounce when it was a one stride) we were both luckily not seriously injured and made a laugh out of it and even more so when we watched the video on repeat. I decided not to compete in the other three rounds of equitation as Sym was a bit sore but recovered better then ever thanks to the magical Terry from Thinline Australia. With two days of rest Sym was full of energy Saturday morning in our pre ride before we commenced the 2.1 novice dressage test for combined training that afternoon. We were in our element when the time came for our test to be ridden receiving a 69.07% placing 3rd by less then one point. The second faze of Combined Training was showjumping. I was very focused and determined to ride very strong and accurate to give Sym the best lines and approach to each individual fence, walking the course twice and having a super warm up we completed the showjumping round with no faults finishing up in 3rd place overall and on a massive high. Symmetry wore the Wilson equestrian dressage bridle that left her in full comfort with the beautiful soft leather. Symmetry is now on a spell for the rest of this month and will be brought back into work in august ready to compete in dressage, showjumping and Eventing competitions. 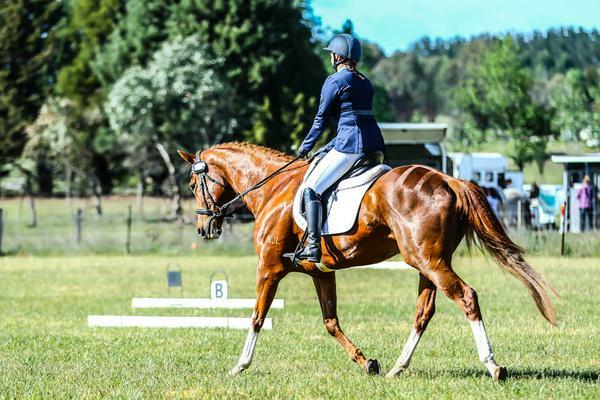 This entry was posted in Team Riders and tagged Dressage, Equitation, Show Jumping, Tayhla Vuleta, Team Riders, Team Wilson Equestrian, Wilson Equestrian. Jessie Smith – Keeping busy!! Getting Results! Andrea is taking out Dressage all over the place!